2006. Penguin. Hardcover. 371 pages. Annabel used to be friends with popular Sophie, but the beginning of a new school year finds Annabel a scorned outcast for reasons kept a mystery until later in the book. It doesn’t help that Annabel’s family has had a rough couple of years with her mother’s depression, her sister Whitney’s depression, and Annabel’s increasing reluctance to continue her part-time modeling work. A burgeoning friendship with fellow outcast and avid music lover Owen Armstrong promises to shake up Annabel’s outlook on her life, if only she will let herself open up to it. Usually my forays into young adult literature stick to fantasy and dystopian novels. 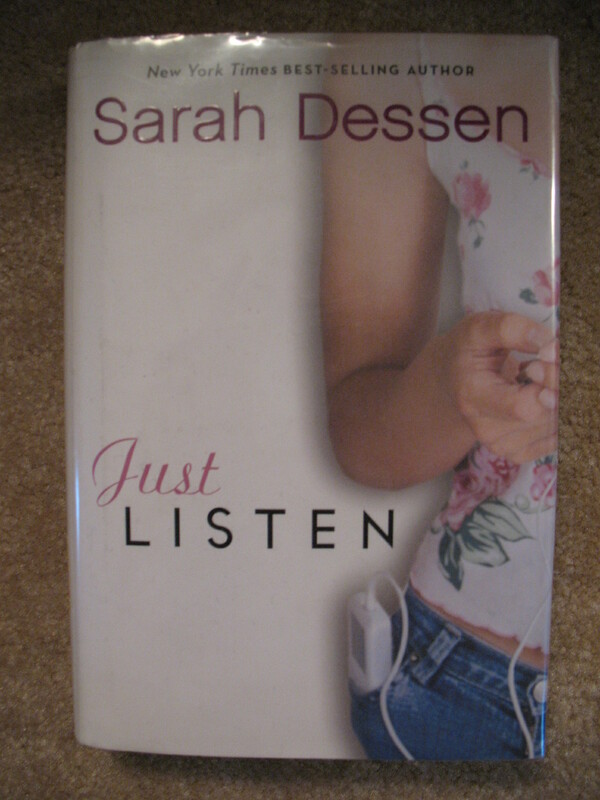 However, bloggers have consistently praised Sarah Dessen’s books and a review from Ana at Things Mean A Lot finally pushed Just Listen onto my to-read list. I actually checked out the audio-book format first. The reader’s interpretation of Mallory, Owen’s fashion-crazy little sister, was hilarious but I disliked her voicing of Owen. Also, the reader seemed to give unnecessarily poetic emphasis to solid, but workaday sentences and this seemed silly to my ears. So, to save the book from unfair detriment, I put a hold on the ‘regular’ book version and finished out my reading in that format. Much better! Although I am in my late twenties, I definitely identified with one of the main themes of Just Listen. Owen is committed to always telling the truth, and pushes Annabel to tell him what she really thinks. Annabel has been used to holding back and telling people what she thinks they want to hear, as opposed to giving her honest opinion. She says what is nice, but not what is true. I know that I fall into that trap myself, casting a bland pall over my conversations and missing opportunities for real interaction. I will likely seek out another Sarah Dessen book in the future. If you’ve read any others of hers, feel free to recommend which one I should try next. 2003. Granta. Paperback. 288 pages. In the winter of 1996, Anna Funder left her native Australia to live in Berlin, working at a German television station. When a viewer writes to complain about the lack of programming about the former German Democratic Republic (GDR), Anna is spurred to gather GDR stories on her own. Anna places a newspaper ad to solicit interviews from people who used to work for the GDR’s State Security: the Stasi. The Stasi was the secret police that monitored the GDR citizens for acts against the state, using all sorts of covert intelligence methods to do so. Anna also records the stories from people she met whose lives were significantly impacted by Stasi intrusion in their lives. It’s been since August since I’ve read and reviewed a non-fiction book for this blog (not counting the tree field guide). I really love delving into non-fiction reads, so that’s weird. Well, however that unplanned hiatus happened, Stasiland was a terrific choice for a comeback! It’s one of those non-fiction books where I found myself stopping and reading aloud sections to my roommate. Unsurprisingly then, my review is rather quote-licious. I was in second grade when the Berlin wall fell, and we barely got past World War II in my high school history class. Therefore my knowledge of the Iron Curtain, etc. was not strong going into Stasiland. Fortunately Funder doesn’t assume too much background knowledge of the reader. The book provides some “big picture” passages to describe Stasi methods and organization, as well as the rise and fall of the GDR. That said, the word “stories” in the subtitle is absolutely accurate to the tone of this book. 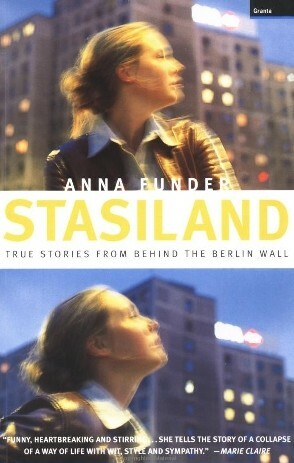 Stasiland is not a systematic outlining of life under the GDR. Rather, it has a very organic feel which I enjoyed. Anna’s interviews are interspersed with her observations of Germany and German life in 1996. The interviews are contextualized with information about how they were set up, where they took place, and other such details. I thought this approach was especially fitting for her interviews of people who stood up in some small way to the Stasi. These are just regular people telling their stories about life under scrutiny. The separate stories of Julia and Miriam are perhaps the most engrossing stories of the book. When Miriam was sixteen, she tried to cross over to West Berlin, and got surprisingly far before she was caught and subsequently jailed. Julia was the woman from whom Anna sublet her apartment. Julia was scrutinized by the Stasi when she started dating an Italian man. ‘It did distance the people from us, because it was in such stark contrast to the reality.’ He can switch from one view to another frightening ease. I think it is a sign of being accustomed to such power that the truth does not matter because you cannot be contradicted. Before he could answer an official, a square-built woman in uniform, stepped out from behind a column. ‘Miss, you are not unemployed,’ she barked. [Charlie] and Miriam had put in applications to leave the GDR. Such applications were sometimes granted because the GDR, unlike any other eastern European country, could rid itself of malcontents by ditching them into West Germany, where they were automatically welcomed as citizens. The Stasi put all applicants under extreme scrutiny. People who applied to leave were, unsurprisingly, suspected of wanting to leave which was, other than by this long-winded and arbitrary process, a crime. An ‘application to leave’ was legal, but the authorities might, if the fancy took them, choose to see it as a statement of why you didn’t like the GDR. In that case it became a Hetzschrift (a smear) or a Schmahschrift (a libel) and therefore a criminal offence. On 26 August 1980 Charlie Weber was arrested and held in a remand cell. I am reminded of the story of a factory worker who, after she was approached to inform, announced loudly the next day at the canteen table, ‘Guess what! You wouldn’t credit it, but They think me so reliable that I’ve been asked to inform!’ Her cover blown, she was useless and she was left alone. I could probably continue to talk and quote from this book, but I should probably leave some aspects of the book for readers to discover themselves! I was hoping Anna Funder had written another book, but this is her only one. I’ll keep an eye out in the future in case she turns up again. 1901. Puffin. Paperback. 380 pages. Kim is the orphaned son of an Irish soldier, raised in India where his father had been stationed. Incredibly street-wise and savvy, the boy encounters an elderly lama in his city, and ends up accompanying the lama on the old man’s spiritual quest. Along the way, Kim delivers a message for Mahbub Ali, a horse dealer who has been a sort-of father figure to the boy. Kim’s successful delivery and subsequent events in his travels with the lama put him on the path to be educated as a spy for the British. The main appeal of Kim was watching its young protagonist cleverly suss out a situation, and use his intuition about human nature to turn that situation to his advantage. I can see why author Laurie R. King used Kipling’s book as inspiration for one of her Mary Russell / Sherlock Holmes novels. The fun of reading about Mary Russell was watching her use her powers of observation to investigate cases. Mary and Kim are of similar stock. One may think that a spy adventure tale from 1901 would be a mouldering, musty thing but that’s not true in this case. It always pleases me how the classics can still maintain a fresh snap. In particular, I liked Kipling’s descriptions of travel and the places Kim sees on his journey. Here’s an excerpt of one such description, when Kim and the lama are settling down for a night on the road along with other travelers. By this time the sun was driving broad golden spokes through the lower branches of the mango trees; the parakeets and doves were coming home in their hundreds . . . Swiftly the light gathered itself together, painted for an instant the faces and the cart-wheels and the bullocks’ horns as red as blood. Then the night fell, changing the touch of the air, drawing a low, even haze, like a gossamer veil of blue, across the face of the country and bringing out, keen and distinct, the smell of wood-smoke and cattle and the good scent of wheaten cakes cooked on ashes. The book does show its age with its recurring references to Kim’s “blood” as directing him to react in certain ways – the Irish blood in him. Of course, Kipling was the writer who wrote the infamous poem, “The White Man’s Burden.” So that he would attribute traits to a character’s race is not surprising, but cringe-worthy all the same. 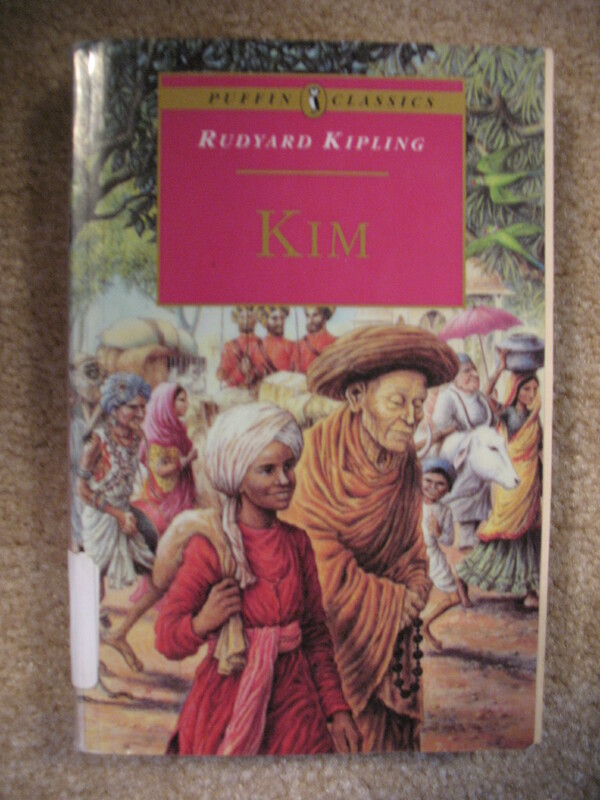 Fortunately, with Kim, Kipling seemed more intent on telling a good yarn than on pushing a particular agenda (though a post-colonial literary criticism of Kim would be interesting to read). Kim himself seems indifferent about being white, a “sahib.” When he is enrolled in an English school in India, he uses his vacation time to insinuate himself once again among the masses, where he is more at ease. Kim’s nickname in the book is Friend of All the World. The relationship between Kim and the lama forms the emotional ballast of the book. Kim is fiercely loyal and protective of the lama. Kim acquires a number of father-figures throughout the book and all except the lama are part of the Great Game, the British covert struggle against Russia for control in central Asia. Except for the distant Col. Creighton, Kim’s handlers exhibit a genuine affection for the boy and I enjoyed seeing them all take their young protégé in hand. I was sometimes confused by Kipling’s use of multiple names for the characters. He would sometimes unexpectedly change tacks with the story as well, and it would take me a moment to figure out what was happening. However, some of my confusion may be attributed to reading Kim as a lunch break book, reading about 30 pages at a time. I liked Kim, though it’s not the type of story to have staying power with me and be a favorite. I am curious though to re-read that Laurie R. King book, called The Game, now that I know the story of Kimball O’Hara. That’s one of the perks of reading classics: you get to unlock the references made by later literature. Just this weekend even, I ran across a Kipling reference in E.M. Forster’s Howard’s End. *Note of interest: I came across at least two blog posts where the readers abandoned Kim, so obviously it’s not for everyone! 2008. Scholastic. Hardcover. 374 pages. Katniss is from District 12 (somewhere near what is Appalachia now) and supports her mother and younger sister through illegal hunting and herb-gathering. She becomes her district’s tribute along with a boy named Peeta, who she hardly knows though he has long nursed a crush on her. As Katniss prepares for the Games at the glittering and wealthy Capitol, she has a team to help her with pre-Game strategy. Once in the Arena, she will have to use all her wits and strength to survive and – more than that – to survive with honor in a game designed to render its combatants soulless slaughterers. I read very few reviews and none recently before reading this book, and I’m glad I was left unspoiled for many of the details in The Hunger Games. The manner in which Katniss becomes the tribute, the rules of the games, the outcome – these all came fresh to me. And wow, was this book ever intense! There was something very cinematic about the writing in the Hunger Games. The action was written very clearly, which is not always easy to do in novels. There was one scene where Katniss hears her name called by someone in trouble and she races to the rescue with her bow and arrow. I could just see her in my mind, this courageous and lethal girl. I loved Katniss as a character; I loved her most when she was in her protective older sister mode. There were several moments when she is in that mode that definitely made me get teary, if not flat out cry. The world-building was quite good. I liked that Katniss had some allies on the outside: the prep team for District 12. These adults, in their various ways, added to the tension by the knowledge that they shared with Katniss about the Games and the overarching politics. I appreciated that Katniss never failed to notice and inwardly chronicle every meal she ate after arriving in the bounty of the Capitol (prior to fighting in the games.) It shows that indelible mark of hunger which she grew up with in District 12. After reading The Hunger Games, I myself felt a craving for goat cheese on bread, the simple repast enjoyed by Katniss and her friend Gale when they hunted together in District 12. I look forward to reading the rest of the trilogy, as they slowly trickle into my hands from the long public library waiting list! 1923. (1999 release date for audiobook). Blackstone Audiobooks. 6 discs. Jeeves has long been a familiar name without being a familiar personality; I often heard his name referenced in pop culture as the consummate butler. Wanting to get acquainted with the ‘real’ Jeeves and desiring to experience Wodehouse for the first time, I picked this audio CD off the shelf in the library. Other characters include Bertie’s friend ‘Bingo’ who falls in love with every young woman he meets, Bertie’s Aunt Agatha who constantly seeks to ‘improve’ Bertie by marrying him off, and Bertie’s twin cousins, Claude and Eustace whose mischievous ways reminded me of the Weasley twins from Harry Potter. It sounded as though all the cats in London, assisted by delegates from outlying suburbs, had got together to settle their differences once and for all. I quite like the “delegates from outlying suburbs” applying to cats. As an audio book experience, The Inimitable Jeeves may so far be my favorite. Frederick Davidson was a dream of a reader. I loved all his voices for the characters. I will have to see if my library carries any more Jeeves audio CD’s with him as a reader (though Davidson – real name: David Case – sadly passed away in 2005). 1995. Recorded Books. 8 discs. 9.5 hours. Jody Stroud, denizen of San Francisco, is heading home from her job at an insurance firm when she is attacked and then ‘turned’ by a vampire. As she fumbles her way through nascent vampire-hood, she scoops up 19-year-old C. Thomas Flood, a wannabe writer fresh from the Midwest, as her day-minion. Meanwhile, bodies keep showing in the city, victims of the vampire who turned Jody. Jody and Tommy band together with some other unlikely accomplices to take down the vampire. The beginning started off with promise. I was pulled into Jody’s story as she figured out what had happened to her. But then, C. Thomas Flood showed up. I was tolerant at first of his immature and unfunny ways, but by the time the police are taking him into custody near the end of the book, I was inwardly cheering and hoping he’d be locked up for a while. Part of it is certainly due to how the audio-book narrator handled his voice. I know he’s supposed to sound young, but most of the time he sounded like a petulant twelve-year-old. That said, I do not think I would have cared much for the book even in print form. Bloodsucking Fiends is a dark comedy and its humor was hit-or-miss. It was definitely . . . off-beat, or maybe random & bizarre would be better adjectives. It was like this: not long ago, my friend and I watched The Pajama Game with Doris Day on Netflix Instant Watch and found it rather whacked-out. After the first couple of musical numbers, we just threw up our hands because there was no predicting what the cast would sing about next, and which combination of characters would be singing it. One moment the guy is having a duet with his dictaphone and the next the whole cast is giddily rolling down the hill like logs. Listening to Bloodsucking Fiends was kind of like that. One moment Tommy is buying Jody turtles from the Chinatown market as a gift and the next he’s putting her in the freezer. This could be fun, but for me the unpredictability and wackiness felt thrown-together and, at times, forced. There were also a couple of back-to-back disturbing scenes where Jody is threatened – for those of you who have read it, I mean the one that takes place in a morgue, and the other in a vehicle soon afterward. To be clear, these scenes were not played for laughs, but I was just so filled with ‘ick’ while listening that it was hard for me to continue on. I guess you could say that Bloodsucking Fiends pushes some boundaries. I don’t mind being having my boundaries pushed, but I only appreciate it if I think the discomfort is worthwhile. This wasn’t. I did want to know how it ended, especially to see if a predicted plot point would come about (it did, albeit with a slight twist), but I was happy when the book ended. I will obviously not be checking out the sequel, and it will take some persuading for me to try another Christopher Moore book. I just don’t think his style works for me. City of Trees: The Complete Field Guide to the Trees of Washington D.C.
By Melanie Choukas-Bradley. Illustrations by Polly Alexander. 3rd edition. 2008. University of Virginia Press. 438 pages. In both high school and college, I enjoyed studying field biology. Forget Bunsen burners and lab goggles – get me out into the woods and fields where I can examine plants and identify bird calls. Since college, however, I have not picked up a field guide on my excursions into nature. Prompted by the Biodiversity Challenge to find a field guide for my locality, I picked up City of Trees from the public library. 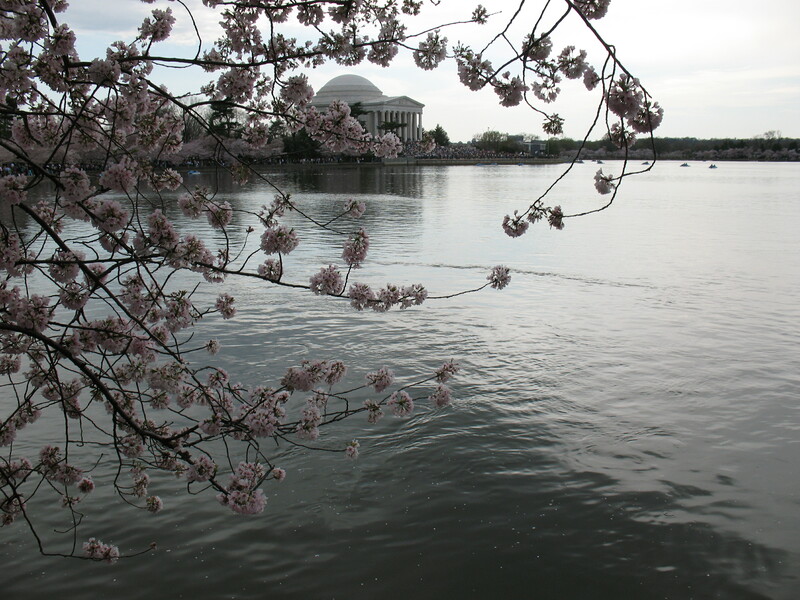 Washington D.C.’s most famous trees are arguably the cherry trees that spectacularly blossom in the spring. However, Choukas-Bradley’s introduction to City of Trees describes an arboreal legacy that goes beyond the cherry trees, a legacy that began with President Washington and continues to this day. 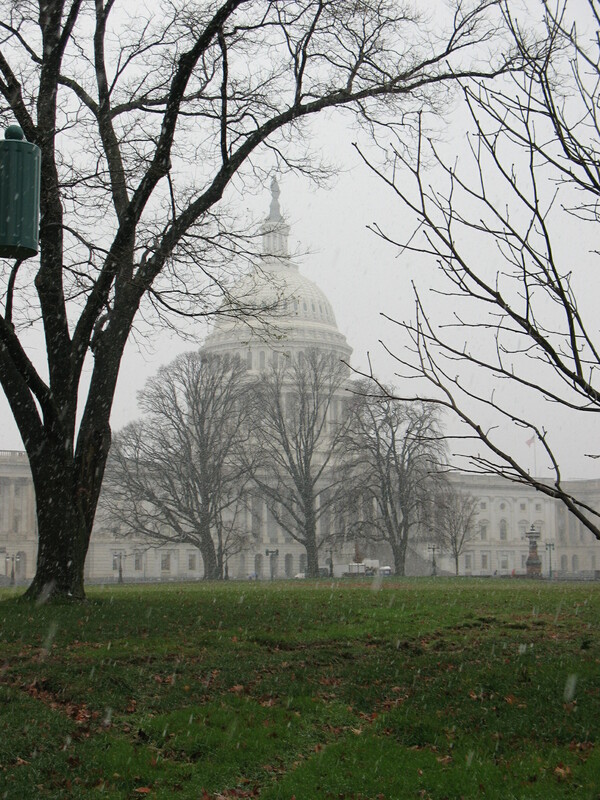 Many people throughout history have sought to improve the nation’s capital with the addition of trees. I found the guide’s history of the White House landscaping and successive presidential involvement particularly interesting. 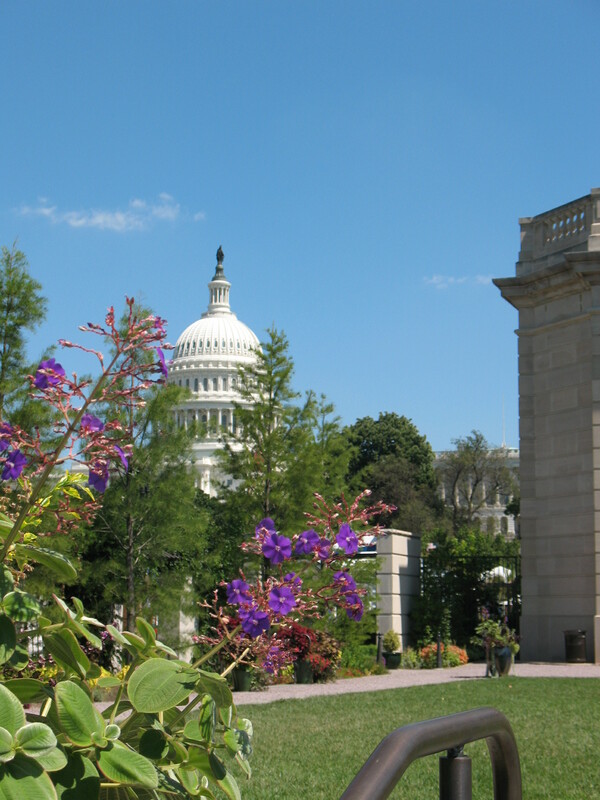 Today, Washington D.C. showcases a wide variety of trees, many of them cultivated trees from other parts of the world. City of Trees is divided into two main parts. The first part is the Site Guide to the City of Trees. The Site Guide describes the types of trees one may view in at particular D.C. sites: places in and around the National Mall, such as the U.S. Capitol and places beyond the Mall, such as Rock Creek Park and Dumbarton Oaks. The second part is the Botanical Guide to the City of Trees. Each tree’s profile includes their range, identifying characteristics of leaves, flowers and so on, as well as the sites where they can be found in D.C. Polly Alexander’s illustrations accompany the descriptions. City of Trees also includes a glossary, a bloom calendar, and an index. I have used City of Trees only once and that was today. I had the day off from work as it is Veterans’ Day. Afflicted with a sore throat, I had been planning on staying in, but the day was so beautiful, I spontaneously decided to take the metro down to the city for the last couple of hours before sunset. I got off the train at Foggy Bottom and walked to the Mall. I stopped by the Vietnam Veterans Memorial first. A ceremony was just concluding and “Taps” floated through the air as I made my way to the glossy wall, which was adorned with flowers and mementos. Veterans in uniform or other identifying clothing were all around. After walking through the memorial, I fished out City of Trees from my bag and set to work on the maple trees above my head. Conclusion: sugar maples. My field biology knowledge was rusty, else I would have been able to identify that one without help. I identified a couple of other trees before heading to the Lincoln Memorial. Climbing the steps of the Lincoln Memorial, I sat on the top step and contemplated the reflecting pool. The dying light was golden. I wished I had thought to bring my camera. City of Trees explained that the pool was lined primarily by elms. Due to the ravages of Dutch Elm disease, efforts have been made to find and plant elms resistant to the disease. I walked then toward the World War II Memorial, passing by Constitution Gardens and its pond full of ducks and a very still heron. There were several beautiful weeping willows around and I also confirmed one tree’s star-like leaves as being that of a Japanese maple. After visiting the lovely World War II Memorial, I set off for home. Though I did not spend a lot of time with this guide, I was impressed by its organization. I especially liked the site guides, so that I could know what kind of trees to expect around a given area. 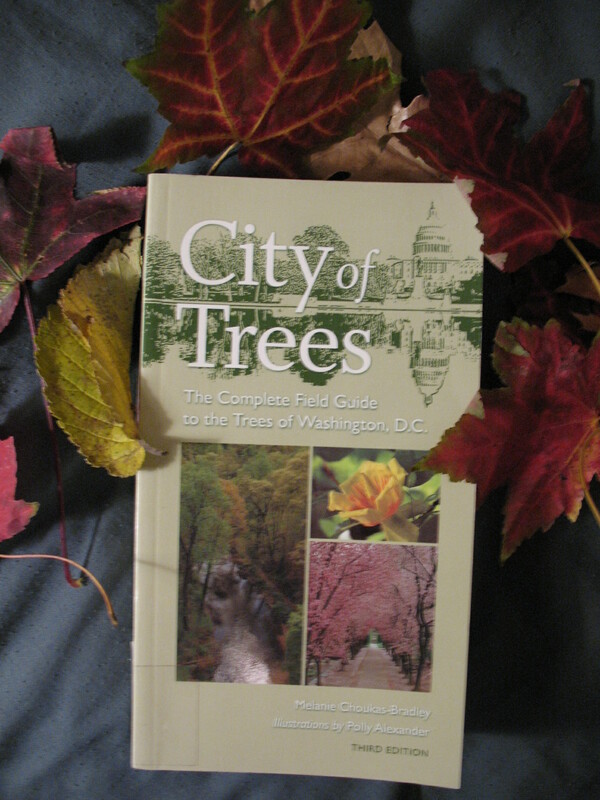 Due to its coverage of cultivated trees often planted in urban settings, Choukas-Bradley pointed out that the guide has been useful in other cities, not just Washington D.C. That said, I enjoyed City of Trees‘ specificity to this area, and I feel that I have gained a better appreciation for the city because of it.